It was always touted to be a match-up between the spinners. Both Chennai Super Kings and Kolkata Knight Riders have an army of tweakers who are useful on sluggish wickets and at Chepauk, the most sluggish of them all, it was going to come down to which team spun better. Chennai's spin trio of Harbhajan Singh, Ravindra Jadeja and Imran Tahir were mighty effective in the first innings with the ball. Harbhajan cleverly varied his pace and forced Sunil Narine to take him dismissing him in the process. Tahir sent back Dinesh Karthik and Shubman Gill while Jadeja also squeezed in a wicket in his economic spell. The three spinners combined to pick up five of the nine wickets to fall and had a combined economy of 4.41. On the contrary, Kolkata's spinners, despite taking all three wickets to fall, were on the expensive side. They had a combined economy of 6.07 on this surface with dew playing a part in their performance. This, however, is keeping in trend with what the spinners have done for either side. CSK's spin trio of Harbhajan, Tahir and Jadeja have bowled 58 overs in all this season while picking up 21 wickets and giving away runs at an economy of 5.38. Kolkata's famed trio of Narine, Piyush Chawla and Kuldeep Yadav have, meanwhile, gifted 466 runs in their 60.2 overs while taking just 10 wickets. Their economy of 7.74 is also pretty average. Only two other sides have spinners who have taken fewer wickets than KKR (Mumbai with 5 and Rajasthan with 9). On the contrary, CSK spinners top the chart with the next best being RCB with 14 wickets. 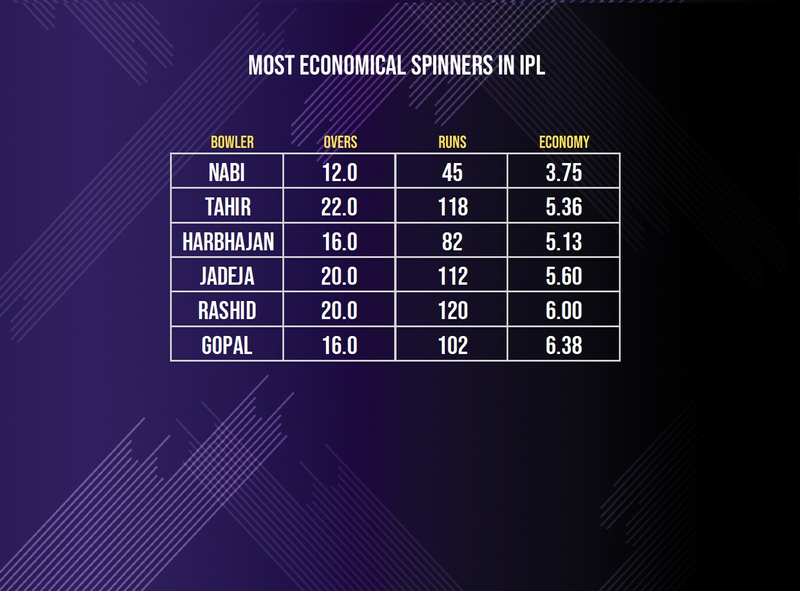 Among the list of most economic spinners in the tournament so far, all three CSK spinners - Harbhajan, Tahir and Jadeja - find a place. They have clocked an economy below 6 and have been terrific for Chennai, particularly in the slow, low tracks at Chepauk. On the other hand, KKR's spinners have misfired. 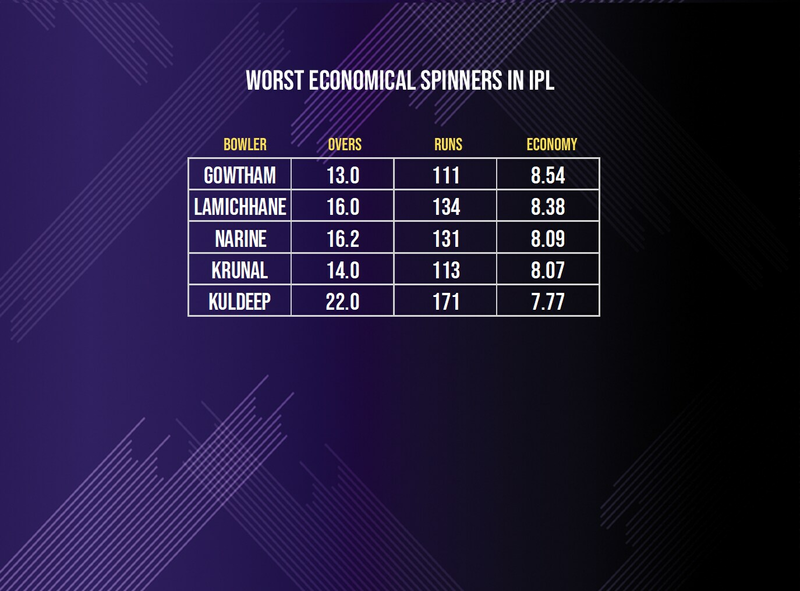 Two of their spinners - Kuldeep and Narine - have among the worst economies for spinners in this season of the IPL. 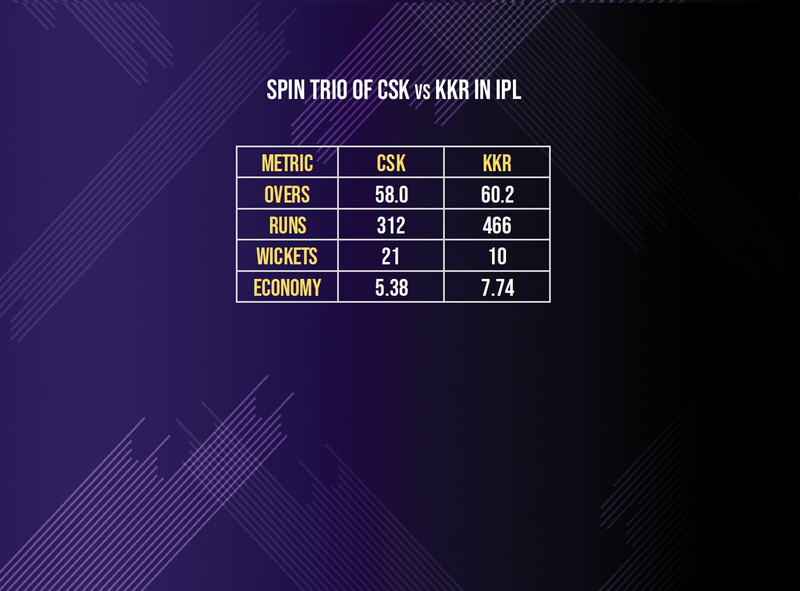 While the battle was meant to be between the spinners, CSK had the clear advantage over KKR's spin trio and promptly edged them out with the very same advantage.